I’ve written before about why you should not make your customer feedback questions mandatory and it remains one of the biggest feedback question mistakes people make when writing a survey. Written properly, your questions will get answered anyway. So just turn off the “must answer” box in your survey software. This is simple disrespect for your customer. You are not respecting the time they are investing in responding and you are introducing the chance for error in the response. If at all possible, do not ask customers for information that they expect you to already have in your systems. It will make for a shorter survey and better responses. Hey, how about buying me a drink and letting me get comfortable before you dive right into the heavy stuff! For many privately owned businesses, asking about revenue is quite high on the “Hey! I’d rather not tell you that!” scale. Did you notice the other big problem with this question? It is mandatory (see the red *) and there is no “I’d Rather Not Say” response. That means that if you don’t want to answer the question you will either give erroneous information or bail out of the survey at this point. So don’t ask anything too sensitive in the first few questions. Let the respondent get to know the process and the survey a little bit before asking anything too personal. Ask some easy questions to get things moving. Later in this survey, they ask about social network preferences. That would be a much better and less confrontational way to start the survey. Selecting a tick box from a list or giving a response on a simple scale (unimportant to very important) are relatively low-mental-effort tasks. On the other hand, providing a written response to a question is a high-effort task. You need to collect text-based (free format) information to gather greater insights into how exactly you need to improve your business. But, they take a substantial mental toll on the respondent, which means that you need to be careful not to include too many of them in your customer feedback survey. 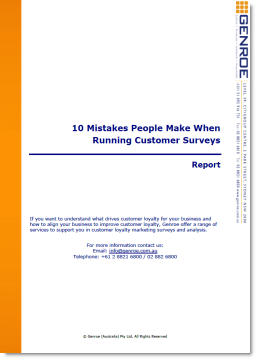 Typically, you should have only one or two free-text questions in your customer feedback survey. More than that will lower the response rate. This type of question is difficult for the customer to answer and provides little information to the business. It is difficult for the customer to answer because most of the time they will not be completely satisfied or dissatisfied so they will not be happy with the response they have to provide. This question also provides you with very little nuanced information on what the customer thinks: just a simple yes or no. On a scale of 0, very unsatisfied to 7, very satisfied, how satisfied are you with our customer service? Now the customer can provide an answer that meets their opinion and you will get a much more nuanced view of what they think. By this I just mean surveys that are getting too long. Making the survey longer simply reduces the response rate, increases the load on customers and reduces the accuracy. Typically you can collect all the information you need in a customer feedback survey in no more than 10 questions. If your survey has 20, 30 or even (and I’ve seen them) 50 pages of questions, you should radically redesign it. Give yourself a 10-questions limit and get to work. What specifically did you dislike about the boarding experience? – The efficient boarding process. What specifically did you dislike about the boarding experience? – I get priority boarding based on my status or special needs. What specifically did you dislike about the boarding experience?– the boarding process. What specifically did you dislike about the boarding experience? – the priority boarding process. The cleanliness of the lounge. The clarity of the public address announcements. People queuing before their seat row is called and clogging up the aisle for everyone else. Okay so that last one is a pet peeve of mine, but you get the picture. Read your responses back, or better yet, have a colleague/sister/uncle do it. Make sure the questions and the answers match before you send out the invites. There are lots of pieces of information that I would know but customers simply have no way of providing accurate responses. This is not because they don’t want to respond or even don’t think they know the answer but because they simply can’t give an accurate answer. For instance have a look at this question from a newspaper feedback survey. In it, they are trying to determine how to make advertisements stand out more. The trouble is that while everyone might have an opinion of what makes an advertisement stand out, it is probably not what really makes it stand out. Humans are not very good at determining the real answers to these types of questions. A much better way to answer this question would be for the newspaper to run tests of different layouts to see which one works best. Another great example of this problem comes from supermarkets. When shoppers are asked how often they purchase house brand products their response is very different to what you find when you analyse actual shopping basket contents. Real shopping baskets contain many more house branded products than survey responses would indicate. This doesn’t imply that respondents are lying but it does show that people are not very good at reliably tracking their actions in the past, or the future. So, review your survey and make sure that you are asking questions that your respondent is able to answer in a meaningful way. Respondents don’t know the answer: this is similar to the newspaper mistake that I mentioned earlier. While it would be nice to have your respondents order what is important to them using this type of question, it’s not the best way to do it. When you have lists larger than five items, it becomes too demanding for the brain to order them in any meaningful way. If you do have a question like this, ensure that you have no more than five elements in the list. How accurate and clear was our loan documentation? This is impossible to answer for your customer and impossible for you to analysis because it has two separate ideas in the same question. Often this seems like a good way to reduce the number of questions in the survey but it causes more problems than it solves. If the customer is happy with accuracy but unhappy with the clarity of the document, or vice versa, they are stuck. They can’t answer the question. In practice, they can only answer one of the two questions you have posed. Similarly, when you receive the results, you will be stumped on how to analyse them because you will not know what question they have answered. How clear was our loan documentation? How accurate was our loan documentation? These mistakes are very common and I’d be surprised if your feedback survey doesn’t have at least one or two of them. Take five minutes now and review your survey. Make sure that you are not making any of these mistakes and lowering the effectiveness of your customer feedback process. Great article Adam. I’m guilty of at least a couple of these. Will make sure not to repeat them in the future. Thanks — I’ pretty sure we’ve all been guilty of some at one time or another! In a lot of cases, the reason customers get asked questions to which companies know the answers is that they have subcontracted the survey work to a company that does not have access to the demographic data. Yes, this is really annoying, and a reason not to subcontract. Glad you liked the list. Anything I should have added? Great list Adam! There are 3 people in our team and we always make sure the 3 of us check the questionnaire before it gets sent out. In regards to the last point, I guess a matrix could do the job as long as the 2 ideas are not opposite to each other? Thanks – glad it was useful. Yes a matrix would work but you can (and many do) make the same error in that format. Great list. We actually use an online engagement package for our consultation. I can really relate to the ‘yes/no’ question. Every time we ask their support centre for help we are sent a survey to seek our satisfaction – it only gives the option for “yes I am satisfied” or “no I am not satisfied”. It gets me a little hot under the collar as it is not always so clear cut…and that is from an industry leading engagement company! Thanks for stopping by – yes sometimes those who should be in a position to demonstrate leadership don’t!